For bond investors, Africa was a happy hunting ground last year. Mozambique and Republic of Congo missed Eurobond payments in 2017, while countries including Cameroon and Zambia agreed or began talks on bailouts with the International Monetary Fund. And since Namibia and South Africa were downgraded to junk, the continent has been left without any investment-grade foreign-currency issuers. Africa’s debt is already less attractive on a relative basis. U.S. 10-year yields rose to their highest in nine months two weeks ago, which narrowed African dollar-spreads to 352 basis points, around the lowest in three years, according to Standard Bank Group Ltd.
Investors are waiting on the OPEC member to devalue its currency, the kwanza, to help ease a shortage of dollars and revive what was, until the 2014 oil crash, one of the world’s fastest-growing economies. Standard Bank says they may have to wait until lawmakers pass new President Joao Lourenco’s first budget, probably by mid-February. Elections in the first half of this year will signal whether President Abdel-Fattah El-Sisi, or his successor, will carry on with the deep economic reforms that have gone down well with portfolio investors, but left ordinary Egyptians reeling from subsidy cuts and high inflation. Ghana’s economy grew 9.3 percent in the third quarter of 2017 as oil production increased. If sustained, it would mark a turnaround for the West African nation, which has had an IMF program since 2015. The nation suffered its slowest economic growth in more than a quarter-century in 2016 as it enacted austerity measures. Kenyans and foreign investors will hope that East Africa’s biggest economy finally ends a political crisis triggered by last year’s elections, the results of which haven’t been accepted by the defeated main opposition alliance. Until it does, President Uhuru Kenyatta will struggle to revive a slowing economy and attract more investment. The southern African nation has been ravaged by a financial crisis caused by the government taking on too much external debt, much of it in secret. It defaulted on a $727 million Eurobond last January and still hasn’t begun formal restructuring talks with creditors including New York-based hedge fund Greylock Capital Management LLC. While the government wants to start negotiations, bondholders say that Mozambique has the money to pay them back and that it should turn to other lenders for a haircut. Nigerian politicians are already gearing up for elections in early 2019. President Muhammadu Buhari, who is 75-years-old and spent many months last year in London getting treated for an undisclosed illness, is yet to say if he’ll run again. Either way, any signs that officials are putting much-needed reforms on hold to concentrate on the vote may unnerve investors in an economy that only recently came out of recession. Will it default again? The oil-producing central African country, which was about a month late on a coupon in mid-2017, is considering halting payments on some debts, its prime minister said in October. It was due to pay a coupon on its $363 million Eurobond at the end of 2017, though it has a 30-day grace period. Despite the prime minister’s comments, the security surged 14 cents to 87 cents on the dollar last month as investors bet the government was closer to striking a deal with the IMF for a loan. Investors will be closely watching Cyril Ramaphosa, the new leader of the ruling African National Congress. February’s budget will be crucial, signaling whether Ramaphosa, who has prioritized stimulating the economy and stamping out corruption, is able to assert his authority over President Jacob Zuma’s administration and if South Africa has done enough to avoid more credit-rating downgrades. Investors will also look for any hints as to whether Ramaphosa will try to force Zuma, whose term runs until 2019, to step down early. The copper producer’s immediate prospects hinge on whether it can get a bailout from the IMF. The kwacha has fallen more than 10 percent against the dollar since July on investor concern that it won’t manage that soon. Without a deal, Zambia is at risk of financial stress, according to Moody’s Investors Service. 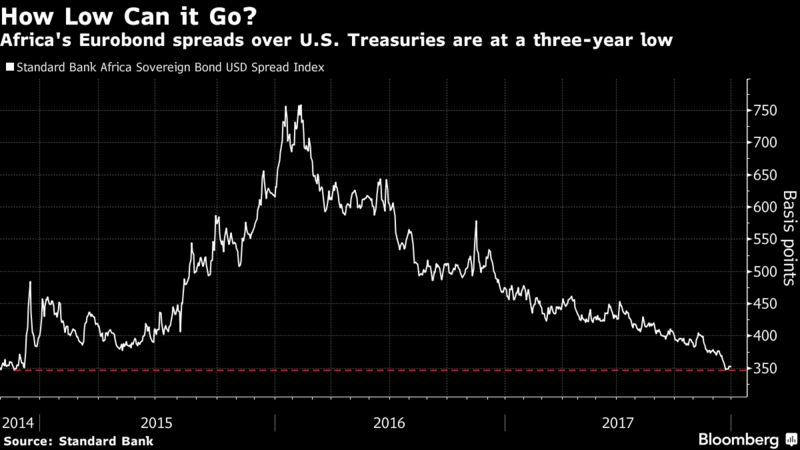 Not a market for bond investors. But Zimbabwe may become tempting for global equity traders again after Robert Mugabe was ousted as president in November. That could open up the country -- once home to one of Africa’s most important stock markets -- to much-needed foreign investment.